After five days of intense competition, a capacity crowd gathered expectantly at the HKFC's show court for the final between Alistair Walker and Laurens Jan Anjema. Keen fans of the event included Heather Deaton, the Vice-President of the World Squash Federation, and HRH King Tunku of Malaysia gathered in anticipation. A warm welcome was given to the arrival of the tall athletic Anjema, and Walker who as ever was bedecked with his trademark headphones and dreadlocks. With only three PSA world ranking points between them (Anjema at 17 and Walker at 14), it was always going to be more of a mental battle than one of technique. Anjema benefited early on from a series of uncharacteristic errors from Walker, but both soon settled down into a solid rhythm hitting deep and waiting for openings. These were quite rare, but when they came, both players showed supreme execution in hammering high forehand volleys into the opposite front nick to the delight of the crowd. With so little separating the players in ability, unforced errors were bound to be costly, and in the middle of the first game Anjema made several and Walker seized the opportunity to pull level, and then close it out 11-8. 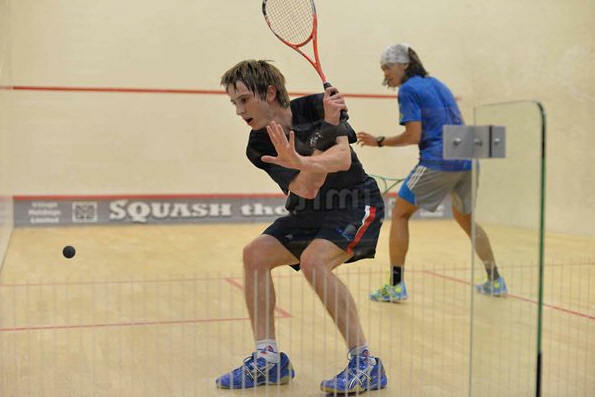 The second game followed a similar pattern with solid depth squash interspersed with sudden attacks but seemingly no matter how tight and fast Anjema hit his drops and attacking boasts, Walker would set off with his trademark expulsion of air from the lungs, and not only reach it but return a strong attacking shot in reply. Again Walker managed to retain his form with fewer unforced errors, and ran out 11-6 up in the second. If anything Anjema started hitting even more dangerous attacking shots in the third game, and at times had Walker launching himself from corner to corner of the court to dig out one apparent dead kill after another. Inevitably frustration set in with Anjema tinning the ball in search of a shot that would not come back. Although always under pressure, Walker kept a stranglehold on the match and concluded the match with an 11-7 finish in the third game. As Walker said after the game, the 3-0 score line was very flattering as at any time Anjema could get back into the game and turn it around very easily. To try to avoid that risk he invested huge energy into apparently "lost-cause" rallies to try to nip in the bud any possible come back. As he put it, "once you are ahead, every rally you turn about is another nail in the coffin". Both players were acknowledged by a standing ovation as they left the court by a crowd very happy to have been entertained by a great display of world-class squash. In his victory speech Walker acknowledged the support of the event sponsors the Hong Kong Football Club, James Niehorster and the efforts of the HKFC squash section which after eight visits to Hong Kong has adopted him as one of their own. Top seeds Alister Walker and Laurens Jan Anjema will contest the final of the HKFC International at Hong Kong Football Club after both completed straight-game wins in their semi-finals. With seeds 3 and 4 Olli Tuominen (FIN) and Karim Abdel Gawad (EGY) knocked out in last night’s Quarter Finals the way seemed open for Laurens Jan Anjema and Alister Walker to have relatively easy semi-finals passages to the final. Opponents, Mahd Nafizwan Adnan (MAS) and qualifier Mohamed Abouelghar (EGY) had both had hard five game matches in the Quarter Finals and it was expected the top seeds to win in style. Up to this stage in the tournament Qualifier Abouelghar had produced a breathtaking display of excellent tight squash mixed in with the usual Egyptian shot making flair to win four matches in four days. 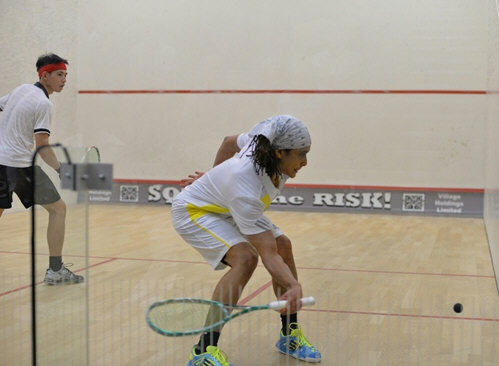 His run to the Semi-final culminating in the close 60 minute, 5-game match against fellow countryman and number 3 seed Gamal in the Quarters. Walker on the other hand had only played two matches and although last night’s match against Hong Kong number 1, Max Lee is shown as an 85 minute game it was split with a lengthy injury break in the second game. With Walker losing the first two games he had to dig deep to bring the match back onto level terms, but once that was achieved he took the last game 11-2. There were two upsets, and nearly a third, in the quarter-finals of the HKFC International. Qualifier Mohamed Abouelghar won his all-Egyptian match with fourth seedc Karim Abdel Gawad, and now meets top seed Alister Walker, who had to come from two games down to see off the challenge of Hong Kong's own Max Lee after 85 minutes. Second seed LJ Anjema despatched Julian Illingworth in straight games, and he also meets an undeeded opponent in the semis after Malaysia's Nafiizwan Adnan came through a five-setter to topple Finnish third seed Olli Tuominen. If the first game gives an indication of what is to follow then the first point is even more reflective of what is to come. So the first point was a let and Illingworth was told to make more of an effort! This resulted in the first of many court door openings to dispute calls of questionable nature. The first game Anjema was ahead 7 -2 but two corkscrew serves brought Illingworth up to 5 – 7. But they were the last points he won in this game with 11-5 the final score. The vocal Illingworth was down 8 -3 in the second when he was warned for racket abuse and then lost a point for ball abuse, which ended with another loss at 11-3. Anjema was playing consistently well and kept up the pressure and even though Illingsworth frustrations became more focused on the third game which was 7 -6 at one point, he still could not raise his game sufficiently with a loss in the third of 11 – 7. Egypt v Egypt will always ensure a good match and with Karim, ranked 20th and Mohamed 76th, expectations were obvious. But what an upset! Mohamed was 6-2 down in the first but came back to 8-6 and finally won 11- 8. The younger players definitely showed more energy and amazing flexibility that stunned us older players. It was a match of attrition with subsequent games swinging both ways, Karim wining the second 11-7, Mohamed the third 11-6,Karim the fourth 11-5. Two all and Mohamed battled to win the fifth 11-5 to go through to the semi-final. A powerful game from the start, both Tuominen and Adnan had a style and sportsmanship that makes the game reputable and enjoyable to watch. The first game was close at 11-8 but the game was close and went to Adnan. Tuominen came back in the second and third quite convincingly with 11-4 then 11-8. Adnan came back with excellent play to take the fourth 11 – 9. Down to the fifth and Adnan forced the game into a very close and long game of 11- 8 win. Tuominen as third seed is now out of the tournament with Adnan as at 7th seed coming up. Their PSA rankings are 24th and 40th respectively.. This game was more equivalent to a final rather than a quarter final. With the crowd well behind the local player, Lee, but still supporting a good friend to the HKFC, Walker. The first game was an excellent win to Lee with convincing shots that had Walker on his back foot. Lee then continued his winning streak into the second game but this was interrupted with a clash that required medical assistance to a cut above Lee’s eye. After some considerable time, the game resumed. Walker then two games down came back (as the PSA number 10 there were expectations) Walker, with his amazing agility of being able to dive on the floor, get back up and still win the point was stunning. Walker came back to win the third game 11- 8 and then 11- 8 in the fourth. Down to the final game, which like all the games was not easy for either player but Walkers experience and determination came through with a win of the fifth game 11- 2. 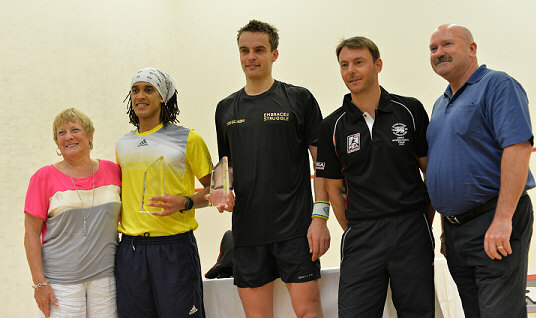 This was squash at its best with good sportsmanship and amazing skill by both players. A busy, busy night of squash in the first round of the main draw, when the Cinderellas from the qualifying rounds finally won through to go the Ball. A packed audience witnessed some top-class squash, with the big guns finally putting in an appearance, but although most results favoured the draw, there were some upsets. Mohamed Abouelghar (Egy) played Henrik Mustonen (Fin) who, I am reliably informed, is a rising star, but his star did not shine quite so brightly tonight as he went down 3-2. The young Egyptian, played some outstanding squash and was the first of the young qualifying guns to win through to the second round of the main competition. The other qualifiers did not fare quite so well, with Nasir Iqbal (Pak) losing to Karim Abdel Gawad (Egy) 0-3, while Muhd Asyraf Azan (Mas) tamely went out to Max Lee (Hkg) 0-3. Rex Hedrick (Aus) put up a very good fight against top seed Alister Walker (Bot) but succumbed in 3. However, he can certainly walk tall, playing with aplomb against the number one seed. In the other games, Julian Illingworth (USA) beat Marwan El Shorbagy (Egy), which was a bit of an upset, given the difference in ranking to Shorbagy’s favour, but the American stuck to his game plan and won 11-6 in the fourth. A contentious match at times, but there was no doubt as to the better player on the night. Olli Tuominen (Fin) romped home against a wild card, Cheuk Yan Tang (Hkg) although, again, the young player did not disgrace himself at all and enjoyed the experience of playing against such a renowned player as Tuominen. Other results went as expected: LJ Anjema (Ned) resisted the late charge of Karim Ali Fathi (Egy) to win 3-0, while Nafiizwan Adnan (Mas) recorded the same 3-0 score against the local player Leo Au (Hkg). All in all, a night of fine squash play which enthralled the spectators who relished the skills of these players whose ability they can only dream of acquiring. But this is the beauty of squash, when the ordinary club player can learn much from seeing the best practitioners of the game. Tomorrow augurs well and many of those who watched tonight will be back again to enjoy this top-quality squash. The second round of the Hong Kong Football Club Open 2013 got underway tonight with the winners of last night’s first-round qualifying tussles fighting it out tonight for a place in the main event which starts on Wednesday 29th May. Four matches were billed and four matches were played, with very differing characteristics. On first were Elvinn Keo (Mas) against Rex Hedrick (Aus) and Lewis Walters (Eng) against Muhd Asyraf Azan (Mas) and what a contrast in matches they were. Keo and Hedrick fought a war of attrition. Keo, the better stroke player, won the first relatively easily: 11-3, but it was as if Hedrick needed this game to get into his stride; he tirelessly retrieved in the second to win 11-4. Keo came out fighting in the third and looked to have clinched it at 10-7, but he reckoned without Hedrick’s superhuman retrievals which evened the game at 10 all and Hedrick eventually took the game 16-14. By this time Hedrick was in his stride and wore Keo down in the fourth to win it 11-5. The highlight of the play tonight was between Walters and Azan, but much for the wrong reasons. Azan has those playing qualities that are reminiscent of Remy Ashour’s, but he certainly does not share that player’s undoubted sense of fair play and humour. [Azan finally won 3-2 in a match not enjoyed by the writer, report curtailed]. The other two matches were rather predictable. Nasir Iqbal, fresh from his problems with visas which almost saw him returned to Pakistan before he had set foot in Hong Kong and only prevented by the intercession of the Pakistani High Commission, dispatched a very plucky Hon Fun Wong (HKG) in 22 minutes 3-0, while Mohamed Abouelghar (Egy), after racing to a 2-0 lead 11-7, 11-7, went walkabout in the third losing 1-11, but going on to close the match in the fourth 11-5.